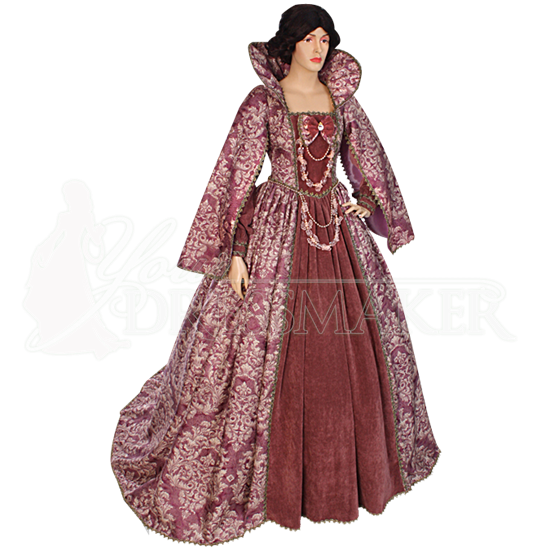 Incredibly regal in its design, materials, and handmade construction, the Renaissance Noblewoman Dress is an impressive display of historic inspired style. Its collar and train will make your royal status known at your next event. This Renaissance gown features open hanging decorative sleeves and is primarily made from ornately patterned brocade. The high, rounded collar frames the face, while bows and draped beadwork decorate the center panel of the bodice and skirt. This center panel and the fitted inner sleeves of this one piece dress are made of antique velvet for an utterly refined and luxurious look. Golden colored ribbon trim decorates the edges and seams for even more extravagance. The modest train is optional, and this dress comes in various color options. Wear a hoop skirt, sold separately, underneath this dress to properly showcase the extraordinary beauty of its voluminous skirt.